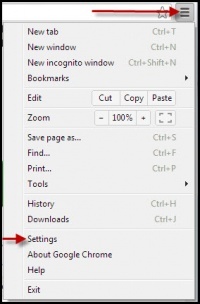 Click on the three short black parallel lines in the top right corner of the browser window and select the word Settings. Under On startup, select the radio button next to Open a specific page or set of pages. Click the link Set Pages. At the bottom of the Setting page, click on Show Advanced settings. Scroll to the Privacy section and click on the Content Settings button. Scroll down to the Pop-Ups section. Click on the circle next to: Allow all sites to show pop-ups.